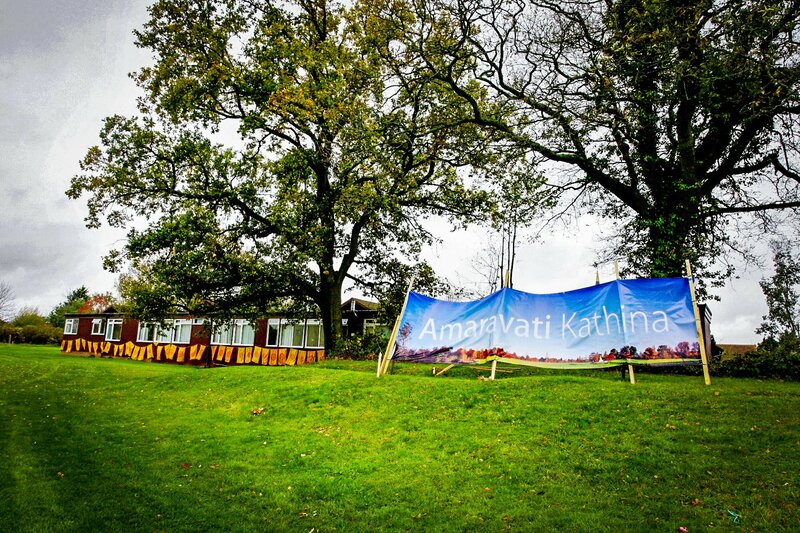 Amaravati Kathina 2014 took place on Sunday 4th November. Sister Tisara offers some reflections on the day . . .
Just getting the place ready for Kathina starts several weeks beforehand, as people meet to work out the logistics and make sure all the other things necessary for the day are in place or available. Sharron Chan is the mastermind for the volunteer efforts, bringing together all the elements of preparation, requirements and people. Suvira is indispensable with her knowledge of everything and everyone involved. 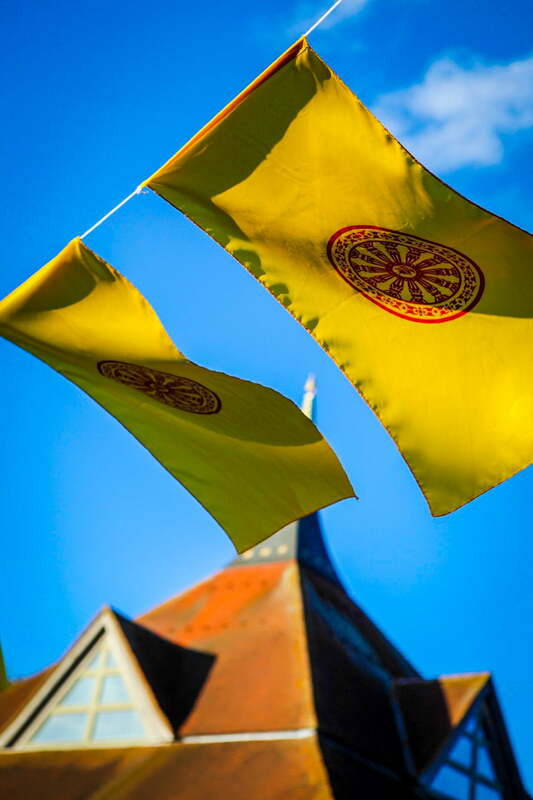 Then are then many practical things, such as setting up the marquee, several tents, the audio, the bins, shoe racks and all manner of other things, done with the help of the monastery guests in the two weeks running up to the event. 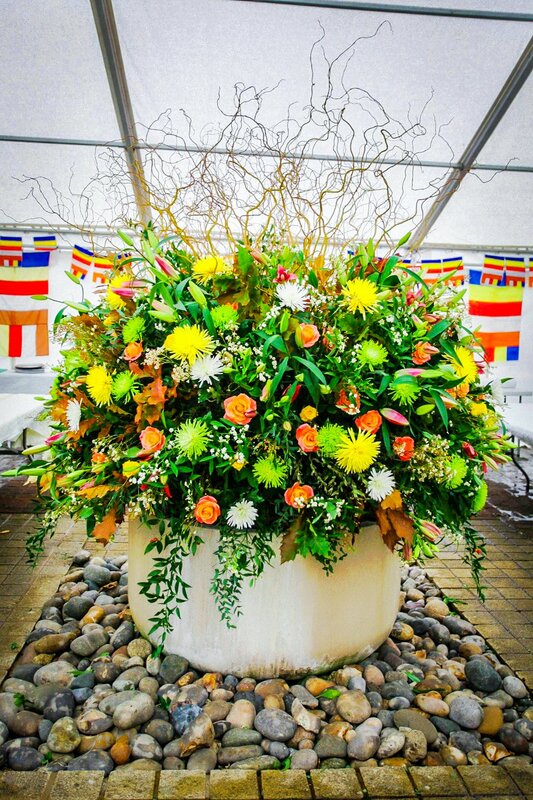 The day before, people start coming for the final preparations and to do the always spectacular flowers arrangements. 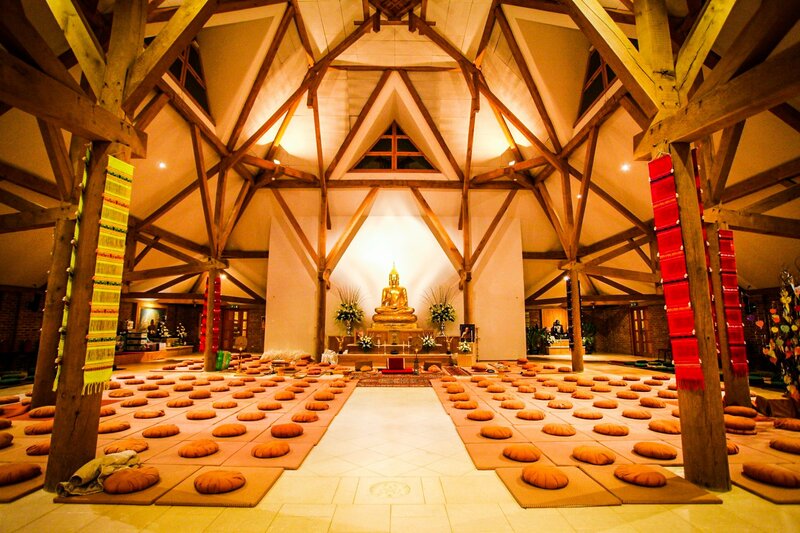 By then, the festival feeling has been building for a while, there’s a sense of wonder at what will happen, the monastery has been made ready to receive everyone, an empty vessel ready to be filled with devotion, in turn spilling out to the world. Some visitors here who are not so familiar with the Buddhist festivals liken the Kathina time to Christmas time, and perhaps yes, the feeling is not unlike that, here we are getting ready to receive all of our family and friends, in a spirit of joy and generosity. The 100-strong volunteer crew, lead by Adeesha, Valerie, Sylvie, Champika, Ray, Lily and Julian move in to place and start welcoming people and offerings as they arrive. The teams worked so well together that even last-minute changes made because of bad weather look like they had been planned all along! 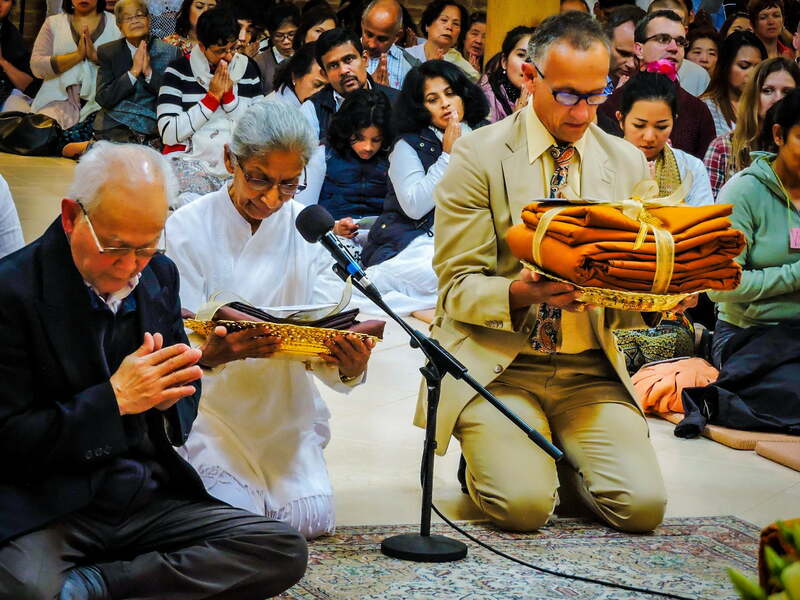 At 9.45, we start the paritta chanting, the blessing chants inviting us all to foster and nurture the spirit of goodwill, reflect on this, and dwell in this. The Buddha, Dhamma, Sangha is my excellent refuge. Wisdom, awake to reality is my refuge. 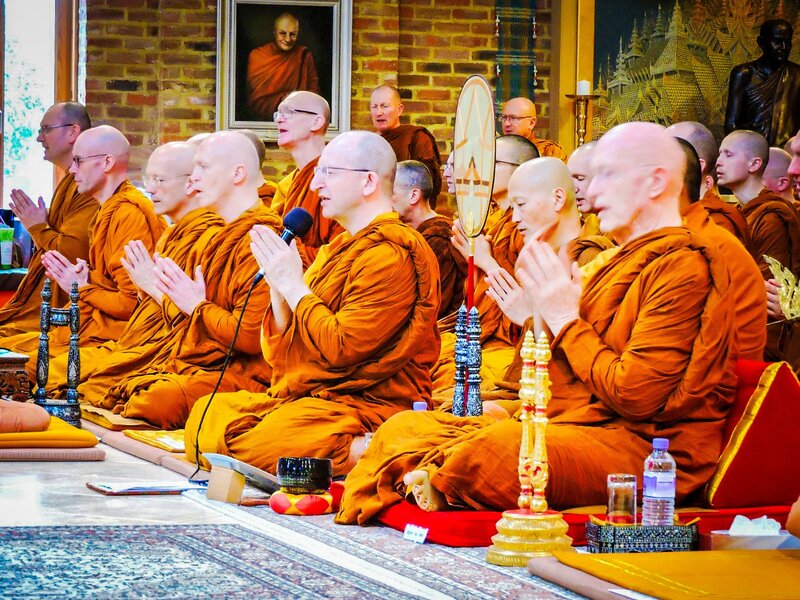 As we always hope, the heavy rain that seemed set in for the morning cleared just in time for the monastics to do their rice pindapat, and resumed directly afterwards. Approximately 900 visitors came on the day, either to join in the morning food offerings or coming in the afternoon for the Kathina Robe offering ceremony. We were privileged to hold a Royal Kathina at Amaravati, and this year the Royal Kathina robe was presented on behalf of his Royal Majesty the King of Thailand by Mr Sang Korn, Minister Counsellor. His wife, Ms. Arunwannee Trijitand and Mr. Thee Phop, accompanied him. The temple was packed by the time the ceremony started. 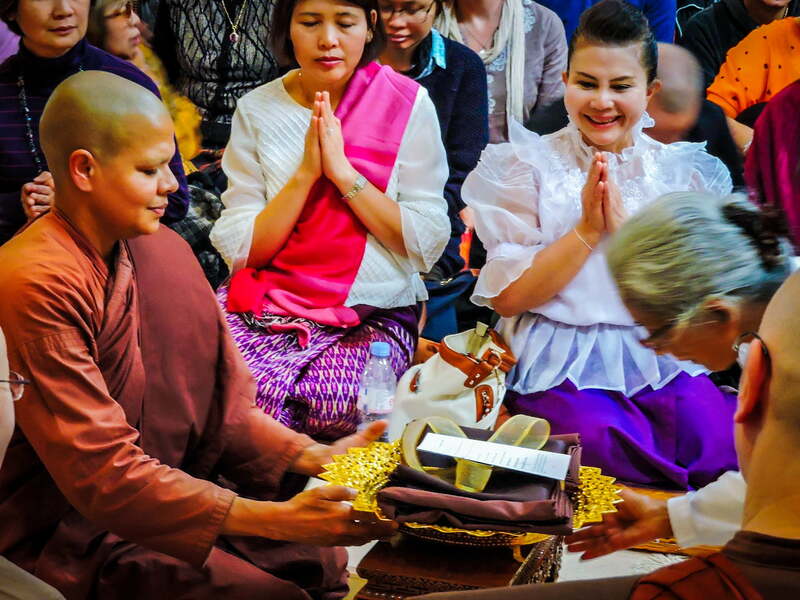 The Royal Kathina robe was offered by the Thai Royal Embassy representatives, followed by John Stevens and Ruki offering robes on behalf of the sponsors. 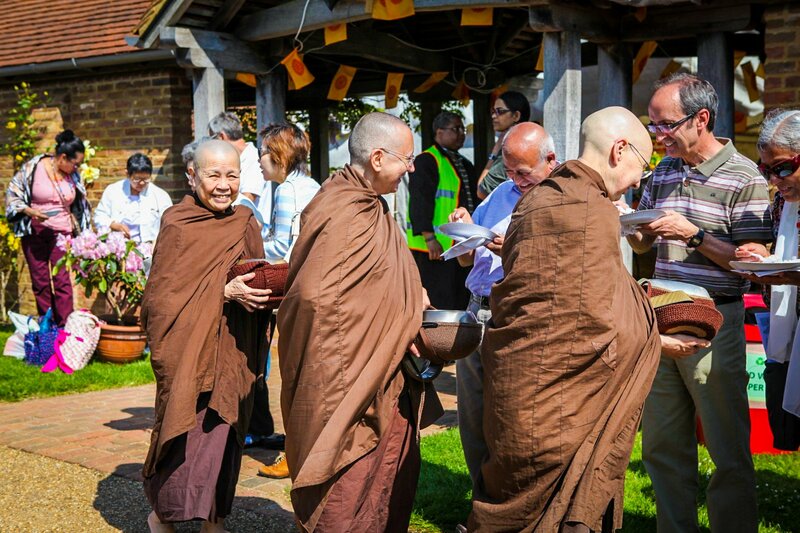 All the guests, Sangha and volunteers gathered at breakfast time. Luang Por Sumedho joined us then, to be greeted by old friends. Final briefings and into the day … a wet, windy and autumnal day indeed. Yet it never rains when the Sangha walk outside for the rice pindapat, does it? 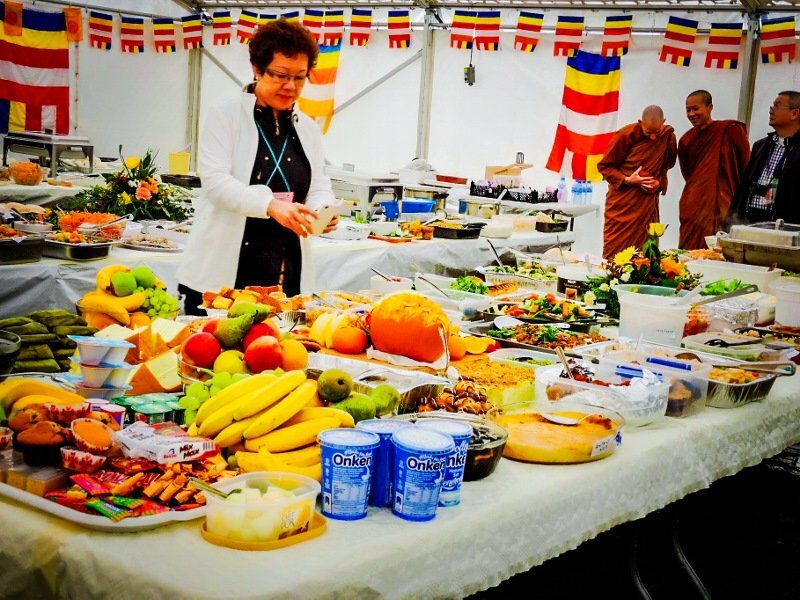 The large marquee starts filling up with offerings of food for the day, the Sangha gather in the temple. A group of monastics from Cittaviveka Monastery in West Sussex joins us just before we start, and there are representatives from all the European branch monasteries present. Later in the afternoon, Luang Por Khemadhammo from the Forest Refuge near Warwick joined us. 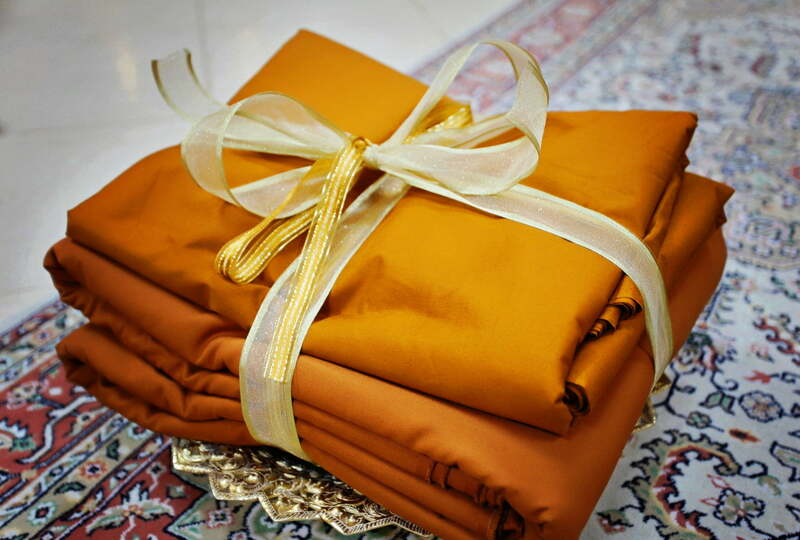 After the robes were offered, some members of the Sangha left almost immediately to start the process of sewing, which for the nuns at least, carried on late into the night! There were many things that were special about this Kathina, over and above the kind of special that this particular festival day always is. 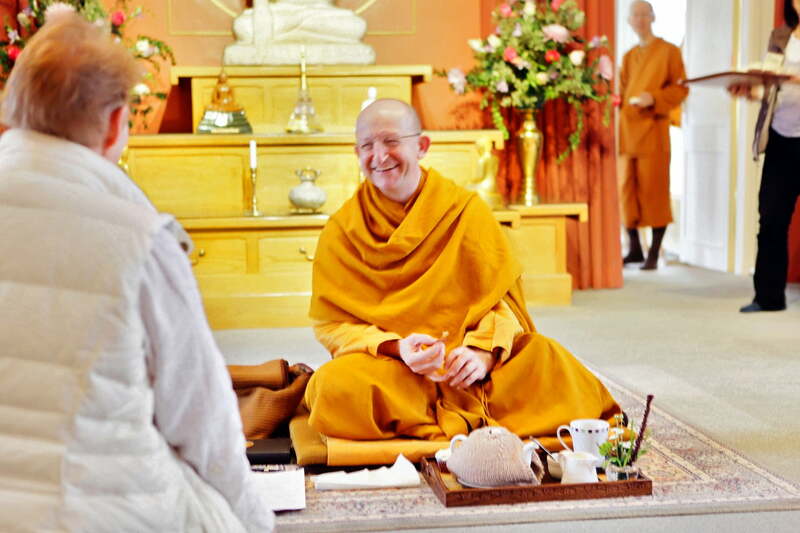 Luang Por Sumedho was present, welcomed with gratitude and delight by the Sangha, old friends and the wider community. 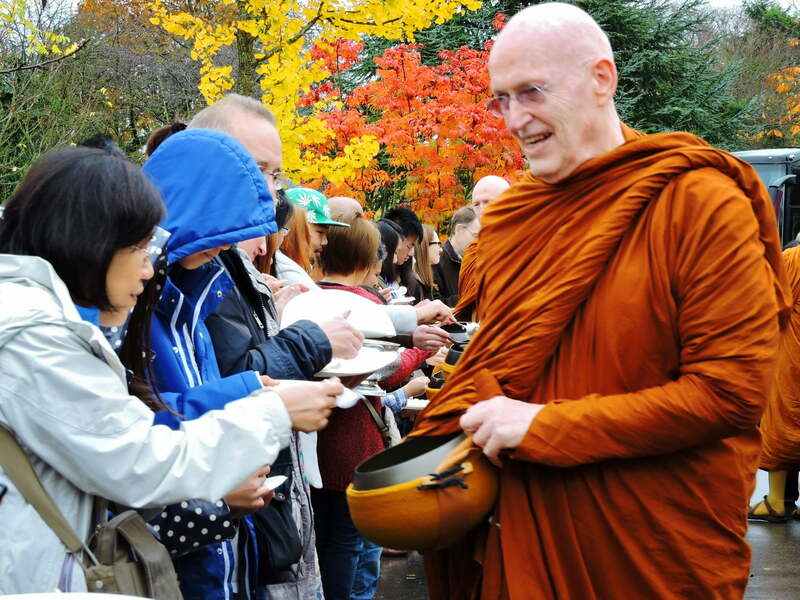 It is touching to see his ongoing concern and support for the community and monastery, which manifests in very concrete generosity too, as he has been encouraging support for the long-term development of Amaravati in Thailand, the fruits of which were presented to Ajahn Amaro in the afternoon. 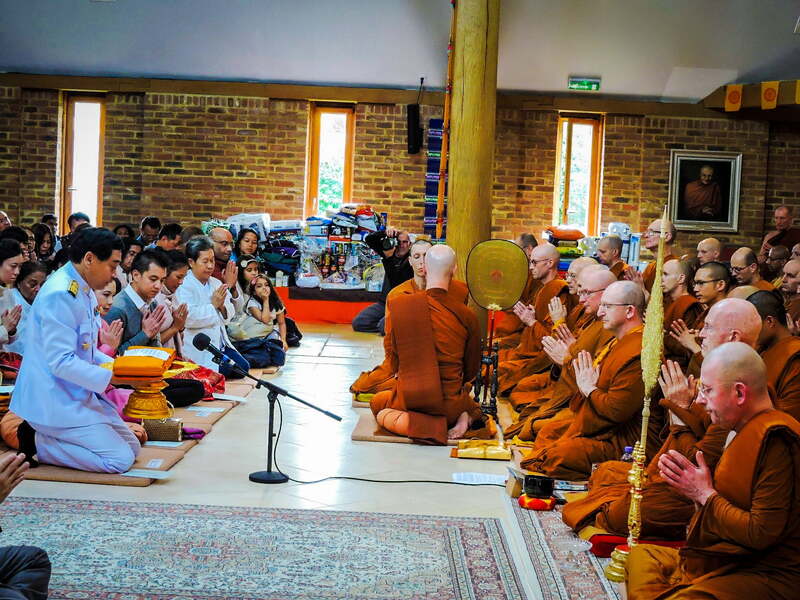 Luang Por Sumedho gave a Dhamma talk after the ceremonies, bringing the formal proceedings to an end.